OUR TURF IS COMING TO YOU. Easy as that. You decide what kind of turf you want and we deliver it to you – within 3-4 workdays throughout Austria. You want our turf to be delivered outside of Austria? Anytime. Thanks to our international experiences we’re also specialists if it comes to long-distance-transports. We’d love to personally give you some tips and tricks! 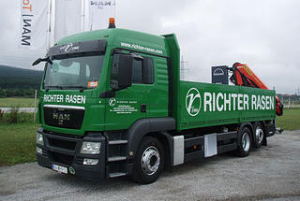 RICHTER RASEN offers exclusively natural turf. All of our products need proper air circulation as well as a sufficient amount of water. After they’ve been delivered to you, they should be laid and watered as soon as possible. Do not, in any case, water or cover your turf with tarpaulins if it is rolled up. You can read anything else you need to know about the correct way to lay your turf here.